(CNS): A teenager has been charged with two burglaries after police stopped the 17 year old boy in a traffic check. Officers from the RCIPS said the teen was stopped On Tuesday 9 April in George Town and when certain property was found on his person he was arrested on suspicion of burglar. Following the arrest further property was recovered and the teenager was then charge in relation to two burglaries one in Victory Avenue on 2 April and another in Marbel Drive on 8 April. The young man is currently in custody and was expected to appear in court Friday afternoon. 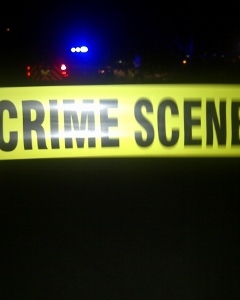 (CNS): Updated Friday 3pm – Police have now arrested a second man in connection with a George Town shooting on Thursday evening. The 22-year-old man was arrested and detained by police following an operation in the early hours of Friday morning (12 April) in the capital on suspicion of attempted murder and possession of an unlicensed firearm. He joins a 29-year-old man arrested on suspicion of the same offences after shots were fired at officers following a car chase through Lakeside Condos in George Town. An RCIPS spokesperson said enquiries into the shooting continued Friday on the crime scene at the rear of Lakeside Condos as well as at a number of other locations in the George Town area. The police were shot at around 8:15 last night, when officers in a marked vehicle were driving behind a Ford Explorer heading south on the Esterley Tibbetts Highway. The Explorer suddenly drove off and sped into Lakeside Condos. The officers pursued the SUV, which then ploughed through a fence towards the rear of the property. As the four occupants bailed out of the car and ran off, shots were fired at the officers who were chasing the suspects onfoot, the RCIPS said. None of the officers were injured and soon afterwards one man was arrested a short distance from Lakeside. Three of the suspects are described as males dressed in dark clothing, while a fourth was described as a male wearing a white shirt and denim jeans pants. Anyone who may have information in relation to the incident should call George Town police station on 949-4222, the RCIPS tip-line 949-7777 or Crime Stoppers on 800-8477 (TIPS). 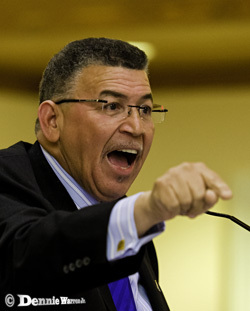 (CNS): Standing adjacent to the dock, the former Cayman Islands premier made his first appearance in court on Friday. McKeeva Bush remained silent throughout the proceedings in the Summary Court as his case was moved to the Grand Court, without him ever being called into the dock. Magistrate Valdis Foldats noted that six of the eleven counts against the UDP leader are category A offences and the remaining five were directly related, therefore the case must be transmitted to the higher court immediately. Despite a request from the West Bay incumbent's attorney, Michael Alberga, that the case be ajourned until after the election, the magistrate agreed with the crown that it had to be at least mentioned in the Grand Court before then and Bush's next appearance was set for 26 April. The former premier, who remains the leader of the United Democratic Party, which is fielding twelve candidates in this election, is facing eleven charges relating to theft, misconduct in a public office and breach of trust. Bush has denied all of the charges against him and has claimed there is a conspiracy by the UK and the current governor to unseat him and derail his political ambitions because of his outspoken attitude and defiance of Cayman's colonial masters. Updated with a happy ending — I have just heard the most absurd story about someone trying to renew their licence – from the horse’s mouth as it were so I know that this is true and not simply ‘marl road’. A friend’s licence expires on his birthday (as do most licences unless you’ve let it lapse for any reason). He is leaving the Island to go on holiday the day before his birthday and will be in another country on his birthday where he has a rental car booked. Being a good responsible citizen and wishing to be as organized as possible, he went to the Vehicle Licensing department to renew his licence. Arriving at the desk, he was told that it is not possible to renew your licence before the date of expiry. Note his licence expires in only 1 week! In addition, having asked to speak to the supervisor, he was told that although the supervisor was sympathetic, his hands were tied … the only solution being offered is to be fleeced of approximately $60 and purchasing an international driver's licence so that he will be covered whilst away. Especially in these difficult times, one can ill afford to pay additional (and one might consider unnecessary) expenses especially those that have not been budgeted for. • Who came up with this absurdly ridiculous change of procedure? • How has it been allowed to be implemented into procedure (without some sensible input)? • Does it not encourage people to be tardy in renewing their licences (therefore allowing more people to be driving uninsured on our roads)? • Is it simply a way to raise more government revenue (i.e. by selling more international drivers licences and charging more ‘lapsed licence penalties’)? So far, the best explanation (if you can call it that) is ‘we sympathise but our hands are tied’! Having written last week about a friend I had who had difficulty renewing his licence, I wanted to provide a positive update. Firstly to the detractors who got lost on the fact that my friend can afford to 1) go on holiday and 2) rent a car but ʻneeded to get a lifeʼ because he could obviously afford the $60 for an international drivers licence, Iʼd just like to say, youʼre missing the point. Itʼs completely irrelevant whether you can afford the $60 or not; itʼs a point of principle that you shouldnʼt have to pay an additional $60 ʻjust because you can afford itʼ, and Iʼm sure those who have commented adversely wouldnʼt want to be fleeced for $60 either whether they can afford it or not! I was interested by one commenter who mentioned a parent who was previously resident who gets a visitors licence each year with no issues. I have a family member (who is Caymanian but hasnʼt lived here in 21 years) who is told heʼs not entitled to a visitors licence and must pay for the 21 years heʼs let his licence lapse (despite holding a valid licence from another country) so it seems there are a few gray areas! For those who thought I was blaming the civil servants, especially those in the Department of Vehicle Licensing, you are very much mistaken. This was not a personal attack on any individuals or even any government department; this was an attack on the legislation that allowed for this situation to arise and I can now confirm that my information is sadly correct — this was not simply a matter of encountering the wrong civil servant on the wrong day. That said, I have a positive update: I can confirm my friend now has his renewed drivers licence. This came about from enquiring with the powers that be but also from a serendipitous meeting with a friendly policeman. Having recounted the story of the licence renewal debacle to a policeman he met the day after the debacle, the policeman agreed it was an awkward piece of legislation but heʼd see what he could do to help rectify the situation and took my friends telephone number. Well, hats off to the civil service because a short while after, my friend received a phone call telling him that if he returned to the Department of Vehicle Licensing and spoke with the same supervisor; they were expecting his return and as long as he was happy to surrender his existing licence and realise that it would expire on the day he surrendered itand not on his birthday (thereby essentially paying for the 1 week left on his licence twice), all would be well and he would indeed be issued with a new licence. So, although in my humble opinion there is still a fault in the law because there doesnʼt seem to be a way around either paying for a (very) short period of time twice OR waiting until your licence expires and driving illegally and without insurance to get the licence renewed, I am pleased to report that this situation has been resolved and happy to let others know that all is not lost. Not only did my friend meet an excellent policeman who was keen to help when he was informed of the situation, BUT he was also greeted by very helpful people back at the Department of Vehicle Licensing who are well aware that the system is not perfect but they are in fact willing to work with the public in any way that they can. A happy ending on this occasion. 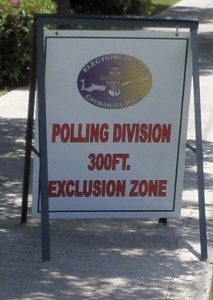 (CNS): With less than six weeks to go before Cayman goes to the polls the election office preparations are in full swing. Officials have already started issuing postal ballots and scheduled the mobile voting. On Monday it will begin a district tour to issue voter registration cards for those electors who wish to use the ballot IDs to help make the voting process go smoothly. 56 candidates are running for office on 22 May and electors have as many as six votes in the capital, so moving a potential of more than 18,000 voters through the stations will be a challenge for officials who hope to make things run as efficiently as possible. Election cards can be collected in West Bay on Monday April 15 at the West Bay Library Parking Lot at the Elections Trailer from 10:00am until 7:00pm. Then on Tuesday 16 April in Bodden Town at the Civic Centre again from 10:00am till 7:00pm. The officials move to East End Civic Centre on Wednesday April 17 from 10am to 7pm and North Side Civic Centre on Thursday again from 10 till 7. The officials will be on Cayman Brac on Friday April 19 the office will give cards out to the general public at the Aston Rutty Civic Centre between 9 and 4 and then again on Saturday for Elections Staff, Candidates and Agents. Meanwhile, voters in George Town can collect their cards from the Elections Office in Smith Road anytime during the week from 9am until 4-30pm. This election will see a record number of voters entitled to cast their ballot and in both Bodden Town and George Town, electors have an increase in the number of votes they can cast. While voters in Bodden Town have increased from four votes to six, the elections office is particularly concerned to emphasise to George Town voters who have for many years cast four votes that then can cast six. With a ballot sheet of 21 names and with a high turn-out expected well over 7500 potential voters in the capital polling may take longer than usual. Election officials are keen to ensure that they get voters through the polling stations as efficiently as possible so that the polls can close on time and the all-important count will not bedelayed. As a result they are urging electors to familiarize themselves with their district candidates and the number of votes they nowhave to ensure they understand their voting rights on Election Day and come prepared to use their votes as they choose without any undue influence. (CNS): Despite regrets by the Central Planning Authority over its decision to give local business conglomerate DMS permission to erect digital signs on the roundabout at Grand Harbour, the firm denies that the signs are a danger and say statistics show that accidents in the area have fallen by 50% since the electronic billboards were constructed. The local business said this suggested that motorists were slowing down at this roundabout which has reduced the risks of road collisions at the roundabout. DMS said the roundabout was designed, engineered and maintained to be a safe addition tothe daily travel of motorists and passengers, while offering an important public message service. “Safety was the top priority in all stages of planning and remains at the forefront of any decision-making where the DMS Roundabout is concerned,” the firm said in a statement released to refute allegations that the digital boards are distracting to drivers and a traffic hazard.The firm said that while the statistics show the roundabout was not a safety concern, there was still an island-wide road safety problem and many accidents and fatalities are occurring where no digital signage is present at all, such as the Esterley Tibbetts Highway. “DMS is committed to working with our community to find solutions to improve road safety and will continue to broadcast messages of road safety and reminders to slow down as part of our ongoing dedication to our community,” the firm said. “The DMS Roundabout was conceived as a gift to our community, an important collaboration between the public and the private sector, providing vital means of communication during special community events, emergencies or natural disasters. DMS recognized the medium of digital signage as a safe, efficient and attractive means for getting short messages out to motorists during their commute, compared to the alternative of multiple banner postings,” DMS stated about the boards erected in the centre of the busy junction. DMS added that the roundabout is available to any group seeking to broadcast an important community message, as under its planning application it is not allowed to broadcast any commercial advertising on the signs. “It is a non-profit initiative that is making a powerful and positive difference in our community,” the firm added. (PDSMA): Recruitment agency CML recently announced that it has funded a one-year scholarship at the Purple Dragon Martial Arts School, enabling a deserving student to participate in the facility’s renowned training programme. Staff and management at CML have decided to sponsor a local student as part of Purple Dragon’s effort to source funding for at least 12 young people. These pupils are primary and secondary students who have been identified by the school, social services or school administrators as individuals who would greatly benefit from the opportunity to participate in the dojo’s (martial arts training hall) legendary training programme. CML joins sponsors Conyers Dill and Pearman, RE/MAX and Digicel offering student scholarships. The scheme offers attendees a chance to learn Purple Dragon’s technique of martial-arts discipline, promoting personal growth through a self-defense curriculum designed around values of motivation, self-control, respect and self-confidence. In exchange, sponsors will gain a contract from each student, committing to regular attendance and timeliness, maintenance of school grades and behaviour reflecting respect for individuals and property. Scholarship sponsors will also receive twice-yearly reports from the Purple Dragon teachers, parents, school and counselors, tracking the performance of the students. “We are thrilled to be able to lend this kind of support to Cayman’s young people, who, after all, form the foundation of our future. Like others in the Cayman Islands community, we are only too aware of the social pressures our young people face as they grow up, and especially so in a time of economic difficulty. Anything we can do to build the community and the future of the Cayman Islands is something we want to pursue,” Mr. Steve McIntosh of CML said. The scholarship is intended for student candidates who confront mental, behavioural or physical challenges, are victims of broken or disadvantaged homes, or who are eager to participate in the dojo programmebut cannot afford the costs. More information can be obtained from Cathy Williams by calling 916-9900, by email at cathy.williams@remax.ky, or by emailing Purple Dragon purple@candw.ky. Visitors to the dojo’s Facebook are welcome at Facebook.com/PurpleDragonCayman or at the dojo located at the Micro Center, North Sound Way in Industrial Park. (CISC): Strong winds and high seas dissuaded all but three of the cruising fleet from setting out around the island for the traditional Easter Good Friday race. Rob Hutchison’s “Shanti” was the first to set off in the pursuit race, with Bruce Johnson’s “Blue Runner” and Fu Liem’s “Java Knight” close behind. All boats were heavily reefed as they made their way along the North coast and were often lost from view in the big swells. Blue Runner and Java Knight caught and overtook Shanti off East End and then battled all the way to the line with Java winning by a corrected margin of just over 8 minutes. Their sailing time of just under 6 hours included a 10 minute penalty for using their engine through the main channel, a necessary safety precaution in the strong swells given their deep draft.